Fuji USA is one of the nation's leading providers of data supplies. USA Imaging Supplies and Fuji offer a complete range of data supplies for the computer users and professionals. Fujifilm's ATO MM tape offers the highest capacity of any 5.25" form factor tape product: up to 40GB (80GB with 2:1 data compression) for the DLTTM 8000. This huge capacity is made possible by a high track density of 208 tracks. If you have any questions give us a call at 619-684-5241. We work for you! Fuji USA is one of the nation's leading providers of data supplies. 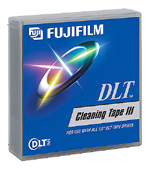 From cd and dvd media to lto tapes or dlt tapes. USA Imaging Supplies and Fuji offer a complete range of data supplies for the computer users and professionals.